Insurance takes care of the Costly Repairs, right? Homeowners insurance is our safety net so when things happen and costly repairs are beyond the normal budget we have the ability to make the repairs. As homeowners we work to pay our mortgages on time, keep up the general maintenance on the home like fixing leaking facets, cleaning out the gutters, and having the trees trimmed that are near the house. These are the small ticket items we can do ourselves to avoid bigger problems related to home repairs. We buy insurance to protect our property and cover us for the expensive repairs, right? And isn’t that why insurance is so expensive? 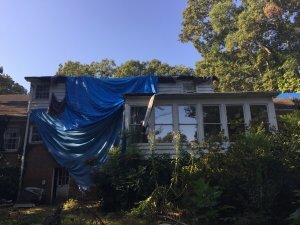 Recently I received a call from a couple who had lived in their home 30 years. Beautiful neighborhood in Charlotte where home values have weathered the storms of recession and continue to see high property values increase. This couple’s all brick home had been unlivable for over a year after a large tree fell on it during a storm. How could this be? Didn’t they have homeowner’s insurance? Isn’t this why we pay those expensive premiums so when the back side of our house is crushed in due to a tree we can make the repairs necessary to live in our home? Insurance is supposed to prevent us from the losing our house due to unexpected repairs. In this case the insurance company turned out not to be the life line they needed to repair their home. As it is expected they lined up three contractors to survey the damage and provide estimates for the repairs.The insurance company went with the lowest estimate when determining how much they would pay to repair the home. There wasn’t a contractor in Charlotte that could fix the home for that amount. They tried numerous times to find a company that would take on the job. And the difference between what it would take to repair the home and what the insurance company would pay was beyond their budget. As they fought with the insurance company over the dilemma the house they were forced to move into an apartment and continue to make mortgage payments on a home that was not livable. The damage that was done by the tree was escalating as the home was exposed to all the weather elements. Imagine knowing you have a leak in your roof that you hurry to repair because you know the water damage will grow if not taken care of. Now imagine the back half of your house and roof taking in rain and rodents for a year? Talk about adding problems to the situation. We think we have all our basis covered for an emergency when we take out home owners insurance. The truth is insurance isn’t a sure thing for a complete fix. American’s spend money on warranties and insurance to prevent unexpected high costs to fix things. But there is no guarantee we will have the coverage needed to cover costly repairs without spending additional money out of pocket. The solution for this family was to sell the home “as is” to an investor. Selling your home for cash to a home buyer is a common solution when repairs exceed your budget.